Background: The primary olfactory pathway is a potential route through which microorganisms from the periphery could potentially access the central nervous system. Our previous studies demonstrated that if the olfactory epithelium was damaged, bacteria administered into the nasal cavity induced nitric oxide production in olfactory ensheathing cells. 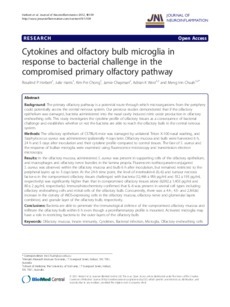 This study investigates the cytokine profile of olfactory tissues as a consequence of bacterial challenge and establishes whether or not the bacteria are able to reach the olfactory bulb in the central nervous system. Methods: The olfactory epithelium of C57BL/6 mice was damaged by unilateral Triton X-100 nasal washing, and Staphylococcus aureus was administered ipsilaterally 4 days later. Olfactory mucosa and bulb were harvested 6 h, 24 h and 5 days after inoculation and their cytokine profile compared to control tissues. The fate of S. aureus and the response of bulbar microglia were examined using fluorescence microscopy and transmission electron microscopy. Results: In the olfactory mucosa, administered S. aureus was present in supporting cells of the olfactory epithelium, and macrophages and olfactory nerve bundles in the lamina propria. Fluorescein isothiocyanate-conjugated S. aureus was observed within the olfactory mucosa and bulb 6 h after inoculation, but remained restricted to the peripheral layers up to 5 days later. At the 24-h time point, the level of interleukin-6 (IL-6) and tumour necrosis factor-α in the compromised olfactory tissues challenged with bacteria (12,466 ± 956 pg/ml and 552 ± 193 pg/ml, respectively) was significantly higher than that in compromised olfactory tissues alone (6,092 ± 1,403 pg/ml and 80 ± 2 pg/ml, respectively). Immunohistochemistry confirmed that IL-6 was present in several cell types including olfactory ensheathing cells and mitral cells of the olfactory bulb. Concurrently, there was a 4.4-, 4.5- and 2.8-fold increase in the density of iNOS-expressing cells in the olfactory mucosa, olfactory nerve and glomerular layers combined, and granule layer of the olfactory bulb, respectively. Conclusions: Bacteria are able to penetrate the immunological defence of the compromised olfactory mucosa and infiltrate the olfactory bulb within 6 h even though a proinflammatory profile is mounted. Activated microglia may have a role in restricting bacteria to the outer layers of the olfactory bulb.